Tensions are escalating with Venezuela’s neighbours. Colombia has become the first South American nation to join NATO and the US army is now supposedly building ‘water wells’ in the Guajira border region. Brazil deployed its army to the border to restrict Venezuelan migration. If ultra-right Trump supporter Jair Bolsonaro wins Brazil’s 7 October Presidential elections, Venezuela will be flanked by extreme right-wing governments with sizeable military capacity and full US backing. The economic blockade continues to bite. US, Canadian and EU sanctions cut off Venezuela’s access to loans and prevent US banks from dealing in Venezuelan debt, curtailing debt-refinancing options. Over $1bn of profits from CITGO, the US subsidiary of Venezuela’s PDVSA state oil company, have been frozen. Brazil is unable to pay Venezuela $40m for electricity provided to border states due to bank freezes. Payments for imports of crucial medicines like insulin and antiretroviral drugs have been blocked. As the UN Special Rapporteur, Alfred de Zayas, argued, US sanctions cause death and have exacerbated Venezuela’s economic crisis. It is accepted that Venezuela is in the grips of hyper-inflation, and GDP has fallen dramatically. The crisis has increased emigration, although this has been exaggerated by imperialist media, which repeated a claim by the UN’s migration agency in August that the ‘exodus’ was nearing the ‘Mediterranean crisis point’ of 2015. But the UN’s own figures belie this, showing that 7.5% of Venezuela’s population are now living abroad (2.3 million) with 1.6 million emigrating since 2015. In comparison, mass migration from violence in Mexico (12 million) and Colombia (7.9 million) are not reported as humanitarian crises. Venezuela’s own provision of health care, housing and social protection to more than 5.6 million Colombians fleeing their country’s 50-year civil war is never mentioned. A report by the UN Migration office of the Venezuelan and Colombian border found 67% of those crossing the border last year were Colombians returning home. Brazilian data indicates that over 70% of Venezuelans enter Brazil for short visits for commercial and trade purposes, rather than to settle. Aiming to stabilise the currency, Maduro announced a series of economic reforms in July and August; legalising trade in foreign currency, transferring ownership of a 30bn-barrel oil-field to the Central Bank as collateral, launching a gold savings scheme, removing fuel subsidies in border towns to combat smuggling. Salaries have been restructured and tied to oil prices and the Petro cryptocurrency, with an increase in minimum wage and state pensions of 3,400%. In addition, a massive reconversion of the currency saw five zeros knocked off the bolivar, relaunching it as the ‘Sovereign Bolivar’. The currency devaluation was sorely needed and though exchange controls had been imposed as a method to prevent capital flight, the chasm between official and parallel exchange rates had reached a record 11,400%, a source of fraud and speculation. However, whether the reforms tackle difficult living conditions for ordinary Venezuelans will depend on who is forced to pay for this devaluation. Will social protections for the working class be slashed or will wealth be clawed back from the capitalists who have ruthlessly exploited, squandered and stolen state money allocated for imports? Whilst private sector importers of primary materials are now enjoying a year’s tax break, public sector workers are protesting over wage increases already being outstripped by the removal of subsidies for public transport and telecommunications. None of the measures challenge control of imports and distribution. 70% of Venezuela’s economy remains in private hands, leaving key lines of supply and distribution in the hands of monopolies opposed to any redistribution of wealth. Seeking alternative sources of credit, Maduro secured a further $5bn loan from China, focused on boosting oil output. In return, Venezuela will cede 9.9% of its shares in the mixed Venezuelan-Chinese oil enterprise SINOVENSA, giving China 49.9% control. China is now Venezuela’s main creditor with $20bn of debt outstanding and accords in everything from mining and gold to education and health. With Venezuela facing economic strangulation by US-EU sanctions, Chinese financing is a lifeline. China has just sent a medical ship, the Peace Ark, to provide Venezuela with medical equipment and help update hospitals around the country. 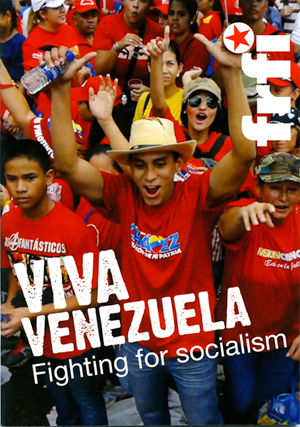 From communal food production in rural Venezuela, to voluntary brigades for industrial production, to street mobilisations against coup attempts and foreign intervention – to overcome the crisis in Venezuela, there is an urgent need to unleash the immense capacity of the organised, politically conscious working class and poor.